Greg Varnell was in the middle with Wendy Young and Rich Prim assisting on the touch. Mr. Varnell did an excellent job. 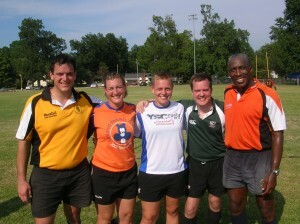 We had a good crew of match officials during the weekend; from the very new to the very, very old. Match officials included in photo below from l to r: Chris Kelly, Traci Schmidtke, Wendy Young, Greg Varnell, and Rich Prim. Our visiting referee from the deep south, Chris Piscotta, was not available for the picture.